Despite being shattered after a long day in the saddle yesterday I still managed to wake myself up at 6.30 so I got up, showered, packed the panniers and went downstairs to breakfast. The Mercure was offering a good buffet range (always interesting to see how better the fare is in the continental hotels than in their UK branches) and I probably ending up overloading on the pastries before checking out. Getting on the bike my legs felt like lead. The short climb on to the ridge turned out to be considerably harder going than it should have been as my body slowly woke up to the idea of going for it again. Fortunately today was due to be the wind down day with less than 30 miles to cover into the centre of the city. This meant that I could take it easy but I still didn’t want to run the risk of missing my Eurostar and I knew that city centre riding was going to be a lot slower than the open road. Therefore I let myself ease into the day and up to the top of the hill. After that the next three miles was a joy of blissful freewheeling back down to the Seine. How on earth had I managed to ride up that hill yesterday at the end of a long days ride? It was no wonder I was feeling the effects. Once at the bottom of the hill it was time to re-join the riverside path for the next ten miles or so; starting on the north bank before crossing to the South side for a lovely long open section often through parkland. The legs had warmed back up by now but I was finding myself riding along at a fairly leisurely pace. Eventually it was time to leave the river in order to avoid the docks and this signalled the start of six miles of fairly miserable riding. The route here was following busy roads and, although mostly on roadside cycle paths, was still less than pleasant. Along the main entrance to the docks there was a mile long stretch of cycle path roadworks which forced me onto the main carriageway, heavily populated by large lorries thundering in and out of the docks. At this point I just had to put the head down and get it over and done with as quickly as possible. The cycle path was eventually reinstated but a couple of wrong turns kept my mood darkening. It turns out this part of Paris isn’t so nice to ride around. A brief respite did ensue as the route joined alongside a tram line but that did not last long. On the approach to St Denis the roads narrowed again and the cycle path came and went. On the approach to the river crossing at L’Ile Saint Denis the cycle way joined the shared road/tram line and I soon made the classic error of riding into the tram line with my wheels falling neatly into the trench. All I could do was curse as, with feet locked into pedals, I lost my balance and fell smack onto my side. I was very lucky. There were no trams or cars behind me and the wheels came out of the tram tracks without any damage. I dusted myself down and feeling increasingly pissed off chose to push the bike over the narrow roads across the island. 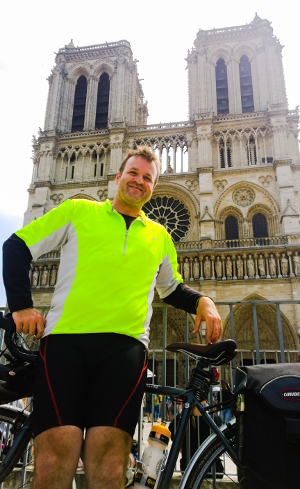 I was therefore pretty dejected by the time I reached the Canal de Saint Denis with still another 8-10 miles to go. Fortunately however the canal provided another lift as it was back to more cycle friendly riding. Just one mile of canal cycle path was enough to relax me again and a bench opposite the Stade de France gave me a nice chance to fully refresh and relax. Another five mile easy riding, mostly on canal paths, was much more what I was expecting of today’s ride and I was soon able to feel and enjoy the Paris spirit. Eventually however the canal ran out and it was onto the main streets of central Paris for the final couple of miles. As you might expect this was a lot of stop start riding and the route wove around various side streets between the Pompidou Centre and the Louvre. Much of the route also followed pedestrian streets so in places I was using the skills I’d learned in Primary School as the Sutton Veny slow bicycle champion, 1982. Still, not to worry, I was getting close and it was nice to get the feel of actually being a part of Parisian life. And then; there was the Seine again and the Ile de la Cite staring me in the face. Crossing onto the Ile at the Pont au Change the end was in sight and, knowing the route from here, I sped down to the other side of the island before hanging a left to make the final few yards to my destination. And there it was – the end of the Avenue Verte route marked out by the Cathedrale Notre Dame. The plaza outside the cathedral was rammed on a hot summer day and I felt that with that many people around that someone should have been thrusting a champagne glass into my hand and lifting me on to their shoulders. Instead I was left to take some ‘with bike’ selfies and give myself a hearty slap on the back on completing my first ever cycle tour. Well that was that – now I just had to head for home. After only about half an hour outside the Cathedral I headed back for the Gare du Nord. I opted for the main roads which worked out well as there was a good shared bike/bus/taxi lane and i was soon there. I took the bike to the luggage check in area at the back of the station which, should anyone be considering putting their unpacked bike on the Eurostar, was an absolute doddle. I headed back to the main station and got changed out of my riding gear in a filthy station toilet (there were signs up proclaiming that it was recently much improved – I’d have hated to imagine what it was like before) and then “treated” myself to a “Long Pig” sandwich at the “Quick Burger” bar opposite the station before checking in and boarding the Eurostar train. It was somehow upsetting to see how quickly and easily the train glided back through some fairly familiar countryside before soon pulling in to St Pancras. Two and a half hours? But that journey in the opposite direction has just taken me four and a half days. The train must have had a tail wind! Getting the bike back was even easier as the luggage guys taking the trolley of bikes off the train saw me on the platform and stopped to let me take mine there and then. Now all I had to do was get the train back to Hastings. It was therefore a shame that at this point South Eastern Railway wouldn’t let me leave St Pancras until gone 7 so I had to loiter in the station bar for two hours. That was hardly the worst hardship though and before I knew it I was home again and ready for a long deep sleep.